Binghamton, NY – December 9, 2016 – McIntosh, the global leader in prestigious home entertainment and ultimate-quality audio for over 65 years, is proud to introduce the D1100 Digital Preamplifier and MP1100 Phono Preamplifier. The D1100 Digital Preamplifier is a reference level stereo preamplifier and digital-to-analog converter (DAC). Its 8-channel, 32-bit DAC is used in Quad Balanced mode with half of it dedicated to the left audio channel and the other half to the right channel. It’s the most advanced DAC McIntosh has ever used and delivers an unprecedented level of performance so that all digital music is reproduced with exceptional accuracy and authenticity. Nine inputs are included to keep even the largest digital system connected as 3 optical, 3 coaxial plus 1 each of MCT, AES/EBU and USB inputs are onboard. The USB input accepts up to 32-bit/384kHz signals and supports DSD64, DSD128, DSD256, DXD 352.8kHz and DXD 384kHz playback. All the other inputs accept up to 24-bit/192kHz. Three sets of balanced and unbalanced stereo outputs connect the D1100 to the rest of the audio system. The D1100 is designed for ease of use: all inputs can be renamed; its 4 data ports and 4 power control triggers are fully programmable; and it has both IR and RS232 external control. It’s housed in a beautifully polished stainless steel and hairline brushed black Titanium stainless steel chassis. For personal listening, Headphone Crossfeed Director (HXD®) brings a new depth and spatiality to music. The D1100 is a full featured, fully functional self-contained unit that can be used independently of any other preamplifier. 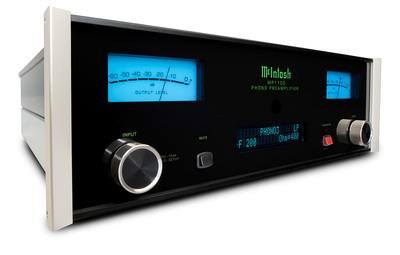 But thanks to McIntosh’s engineering prowess, it can also be connected to and used in tandem with its analog equivalent, the C1100 Vacuum Tube​ Preamplifier. Combining the two together with the included umbilical cable creates the definitive analog and digital stereo preamplifier. When connected, the C1100 takes over all control of the D1100 resulting in a single and easy to use interface. The MP1100 Phono Preamplifier will give vinyl lovers a new level of musical enjoyment and exhilaration. It’s filled to the brim with everything needed to not only play records, but it will also get every last musical note and nuance out of them – including some that may have never been heard before. The MP1100 is designed first and foremost for analog audio and achieves our most accurate equalization ever. 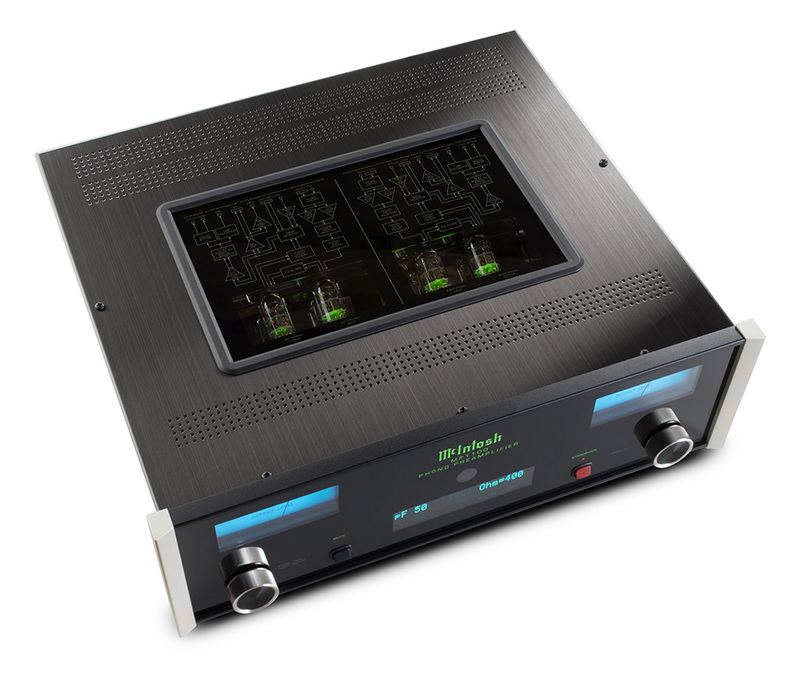 It utilizes four 12AX7A vacuum tubes, with 2 tubes used per channel in a fully balanced configuration – making it our very first fully balanced vacuum tube phono stage. It has 3 sets of RCA phono inputs with XLR connectors also available on 1 of the inputs. All phono inputs allow for adjusting both resistance (6 settings) and capacitance (8 settings). For ease of use, it comes pre-programmed with profiles for Moving Coil and Moving Magnet cartridges as well as the McIntosh MT10 and MT5 turntables. Five additional profiles are included that are fully customizable and can be assigned to any phono input. RIAA, LP, NAB, AES and 78 analog equalization curves are included. Two fairly rare but highly useful analog filters are built-in: a Rumble Filter helps remove noise that may have seeped into a song during the recording process; while a Scratch Filter can help restore the sound of frequently-played records that may have become a little worn, or records that may have some damage. Adjustable gain from 40dB to 64dB allows for further customization, while a Mono setting permits proper playback of mono recordings. In addition, there’s a pair each of balanced and unbalanced high level inputs for connecting other sources. A pair each of balanced and unbalanced fixed outputs round out the connections. Not to completely overlook digital audio, the MP1100 has an optical, coaxial and USB output. They are fixed at 24-bits and can be set to either 96kHz or 192kHz. When used with a properly configured conversion program, the USB output can be used to “rip” albums to a computer. Our digital output clipping indicator will notify the user when distortion caused by loud sections in a song is being recorded to the file, allowing settings to be adjusted in order to create pristine, distortion free digital versions of the album. To combat noise, the MP1100 features a dual mono design. It can be paired with any preamplifier, integrated amplifier or home theater processor that includes volume control. An ideal match is our C1100 Vacuum Tube Preamplifier which also has a dual mono design; both also share the same polished stainless steel and hairline brushed black Titanium stainless steel chassis to create a cohesive system appearance. Orders are now being accepted for both units with shipping anticipated to begin for D1100 in December and MP1100 in January. Founded in 1949, McIntosh Laboratory is known for offering distinguished quality audio products, superior customer service and the ultimate experience in music and film. All McIntosh products are handcrafted at the Binghamton, NY factory by over 150 employees with a passion for music and the McIntosh heritage. McIntosh continues to define the ultimate home entertainment experience for discriminating consumers around the world, with the iconic “McIntosh Blue” Watt Meters globally recognized as a symbol of quality audio. Since its inception, McIntosh has been powering some of the most important moments in music history and pop culture. From President Lyndon Johnson’s inauguration speech to Woodstock to the infamous Grateful Dead “Wall of Sound,” McIntosh has not only witnessed history, it has shaped it. 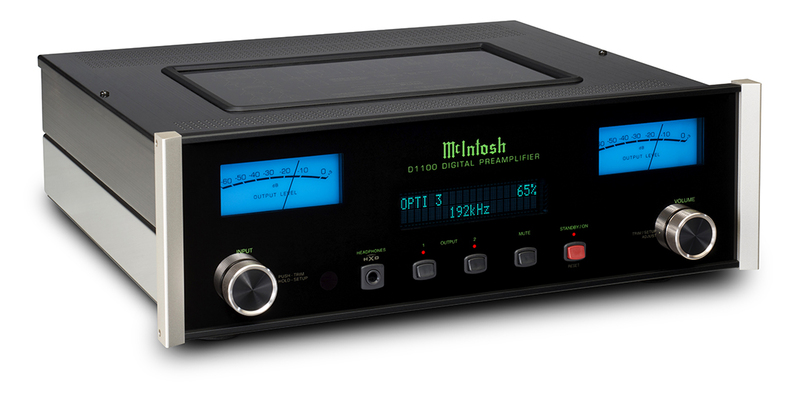 With McIntosh, customers have the ability to create their own premium audio experience – and truly live their music. Visit www.mcintoshlabs.com to learn more.